This post will focus on 920 as it is truly a mind blowing phone ! The event began with the Nokia representative gives some details of the Lumia Sales. Nokia has sold more than 100,000 Lumia units only during the 4 days of Diwali in November . That's pretty decent ! They also cracked the largest Corporate deal involving 4500 Lumia devices . Very Impressive . Makes me wonder about the crap dished out by experts saying that Lumia sales are very poor! These experts can be really biased ! And they are biased against Windows Platform for sure! Next we were given some hardware specs of the models . I have summarized some of these in this post below. We were told of various awards won by Nokia Lumia 920 . These have also been summarized below. The video shot with 920 was rock steady. The one with Samsung Galaxy was wobbly. c) Nokia Lens by which one can remove unwanted objects from the picture. 1. The best screen - 2.4x faster than Samsung S3's screen and 5.4x faster than iPhone 5's screen (tested with Lagom test). Super sensitive and bright screen that can be used with gloves or finger nails. It's the first smartphone in the world to deliver a full 60 frames-per-second (FPS) without any blurring. 2. It has 3pcs HAAC (High Amplitude Audio Capture) microphones and so the recorded audio is distortion free also at the loudest music performances and it can record also very low bass sound vs its rivals has nonHAAC mics and so the recorded audio at music concert recordings is mostly distorted and they can't capture low bass sound. 3. Nokia Lumia 920 is the first smartphone which has pentaband LTE support. 5. Nokia Lumia 920 is the first smartphone with integrated wireless charging. 6. WP8 is smooth, efficient and simple. MS Word & Excel seamlessly integrated. 7. Free Apps: City Lens, Nokia Drive, Nokia Maps, Nokia Music, Smartshoot etc. Augmented reality City Lens is very cool. 9. Premium GPS that can be used also without internet! Before that , lets see some images. First lets see the Windows UI vs. Apple UI . 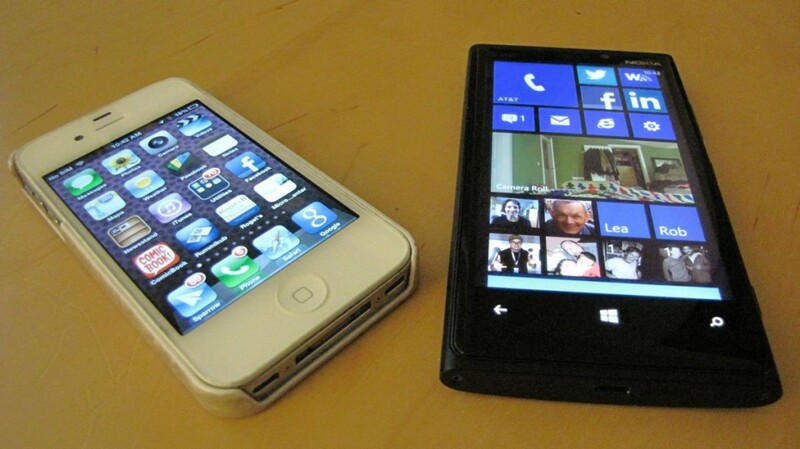 Clearly the Apple iPhone UI looks very tired as compared to super sleek LIVE Tiles of Microsoft. Now lets see the 920 in full glory. Its looks absolutely gorgeous ! The Best Mobile Phone of 2012, Readers Choice Award, Gizmodo, Australia. I am totally convinced that over next few months, Windows Phone 8 will keep gaining marketshare and in particular, the Lumia range will be a big Winner . Willing to bet ? Just before the year ended , we did a wonderful event on "Windows 8 for Business" on December 27, 2012 , at the ITC Grand Central . There was also a small Nokia Counter where we had latest Windows 8 based Lumia Smartphones on display . Many Customers showed interest in the devices on display. All in all , the Customers were hopefully clear that Windows 8 is THE BEST EVER Operating System for a Business User.